The Hex ezCAN has quite a reputation in the BMW R1200GS world. 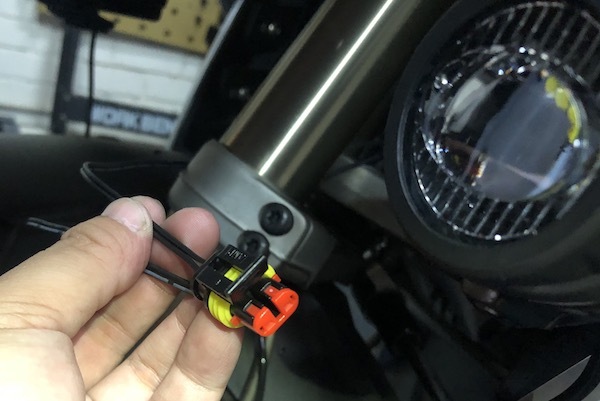 It’s a (relatively) inexpensive accessories manager for the BMW R1200LC, R1200, K1600 & F800 that hooks up directly to the CAN bus of the bike and does quite a number of neat tricks – all WITHOUT having to splice any wires on the bike, and thus (as Hex claims) maintains your warranty. Personally, I wasn’t too concerned with the warranty part as my 2014 GS is already way past its warranty stage. But the neat tricks that the little device has up its sleeves was what attracted me to purchase it. I placed an online order and received it in my mail within a week or so. It comes in a cute little package that somewhat resembles a pack of army rations. The cute package that arrived in my mail. 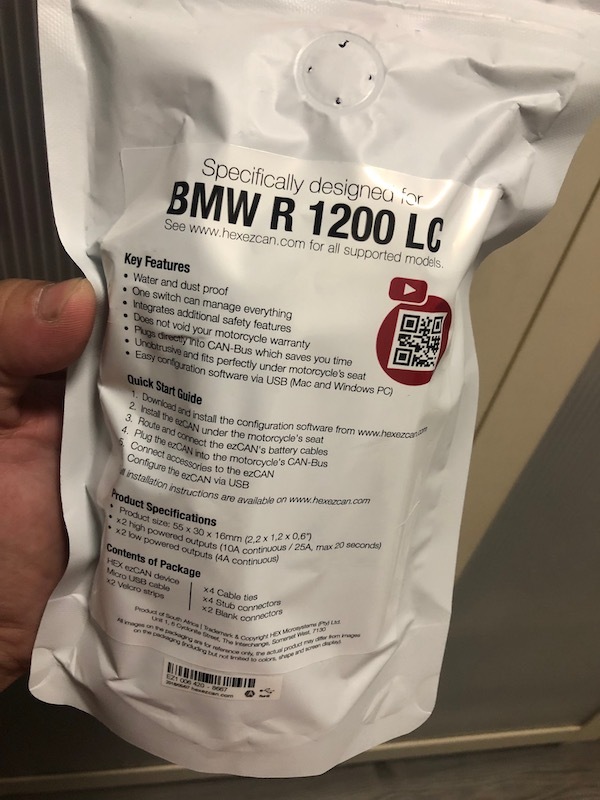 This version was specifically designed for the R1200LC. Here’s what’s in the package. I received the black version instead of the anodised aluminum edition. Assembly of the Hex ezCAN was probably one of the simplest electrical modification or add-on I’ve done on the bike. Simply route the power leads to the battery directly, and then tap into the CAN bus at the TPMS / alarm module with a bypass connector. No cutting of wires at all! The most difficult part of the entire process was routing the wires – which took a little longer than usual as I’m quite particular about keeping the routing neat. The next task was to connect up my fog lights to the Hex ezCAN. 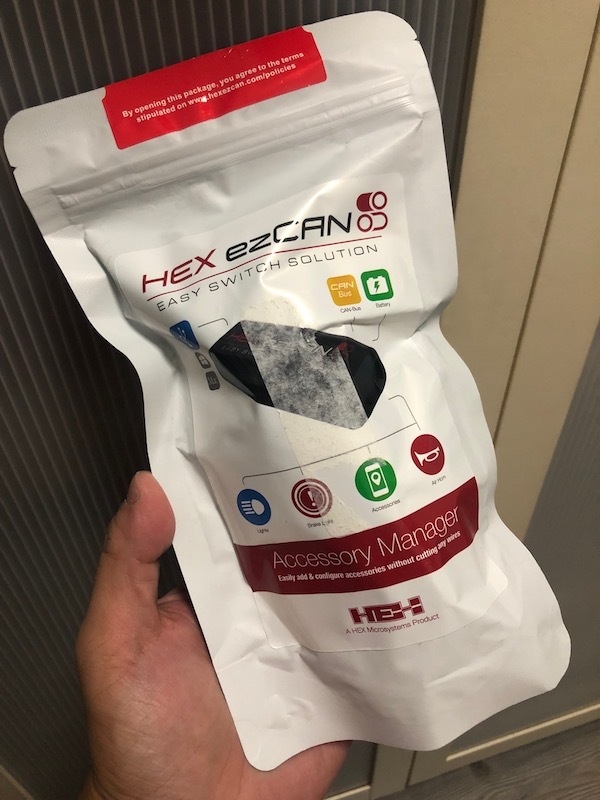 The Hex ezCAN uses the very standard Amp Superseal IP67 waterproof connectors. So I wired up my LED fog extension cable to be compatible with it. 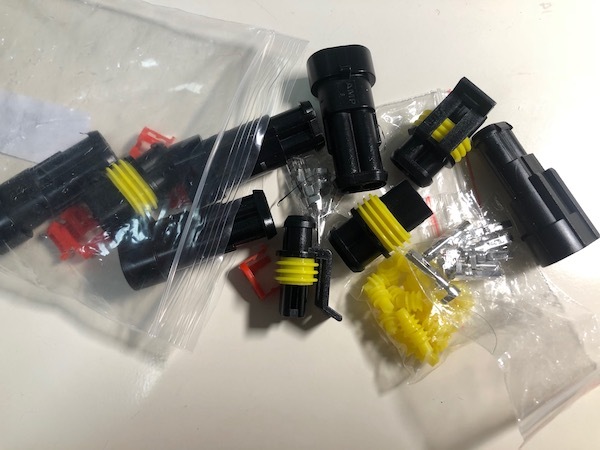 I had a pack of 2-pin Amp Superseal waterproof connectors handy. Wiring up the Superseal waterproof connector on the LED fog lamp side. And finally, configuring the Hex ezCAN was super simple too. 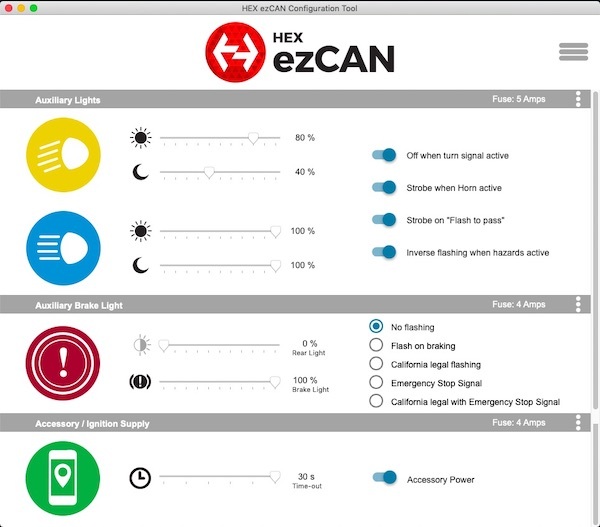 Download and install Hex proprietary config software, wire it up to a laptop via a micro-USB cable, run the software and configure the behavior of the Hex ezCAN. 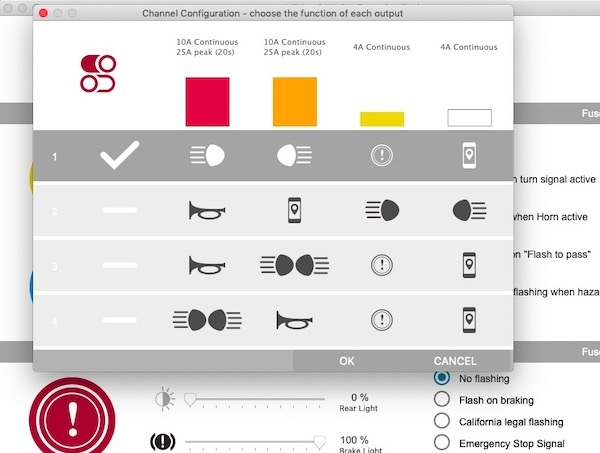 The Hex ezCAN accessories manager uses software fuses, and can be configured to trip at different current levels. Apart from the main 30A fuse that comes with the device, no additional fuse is required! Neat! 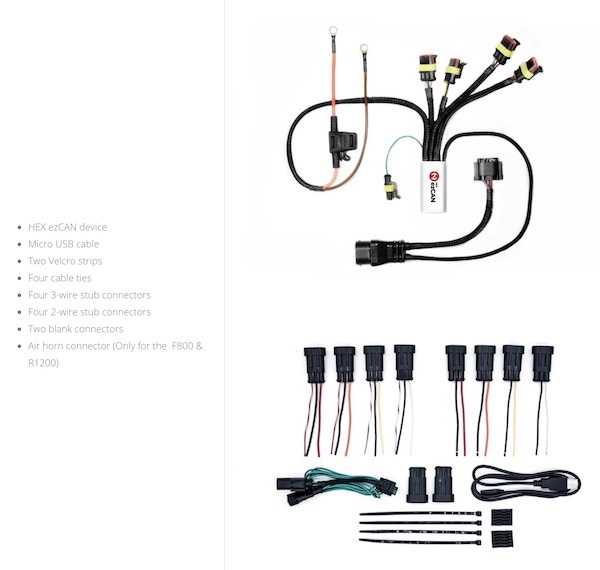 Select how you’d like to wire up the Hex ezCAN to the bike’s accessories. Super easy to install – no wire splicing required. The Hex ezCAN can be used to control any LED fog lights – doesn’t have to be expensive ones. No additional switch for the fog lights is required – just use the turn signal cancel switch. Dimmable fog lights using the bike’s built in Wonder Wheel. Separately configurable fog light brightness for day and for night – the Hex ezCAN uses the bike’s built in day/night light sensor. Fog lights fades in and out when switched on and off – just like those high end DRLs or fog lights on those expensive cars. Fog lights can be configured to flash alternately with the hazard lights – creating greater visibility. Fog lights can be configured to momentarily turn off on the corresponding side when signal lights are flashing – this makes it easier for the road uses in front to see the flashing signal LEDs. Fog lights can be configured to strobe with the flash to pass and/or horn for additional visual warning. Additional brake lights can be added and configured to strobe when sudden deceleration is detected – the Hex ezCAN uses the bike’s built-in accelerometer for data. Configurable fuse ratings for individual channels. So, what do I think about the Hex ezCAN for the BMW R1200GS LC?